Rejuvenate your entire body with our new Body Scrub Mitt. Constructed of dark grey Norwex Microfiber on one side, light grey microfiber and mesh combination on the other, this incredible, one-size-fits-all scrubbing glove fits comfortably on your hands to gently remove dead skin cells from hard-to-reach spots and reveals smooth, glowing and beautiful skin. Size: 15 x 25 cm / 5.9" x 9.8"
Effectively exfoliates your skin allowing your moisturizing products to penetrate your skin more deeply, making them more effective. Leaves your skin looking healthier and more radiant! Two-sided mitt has microfiber on one side and mesh/microfiber combination on the other, eliminating the need for two or more singlepurpose cloths/mitts in your bathroom, saving you money! Conveniently fits on either hand. 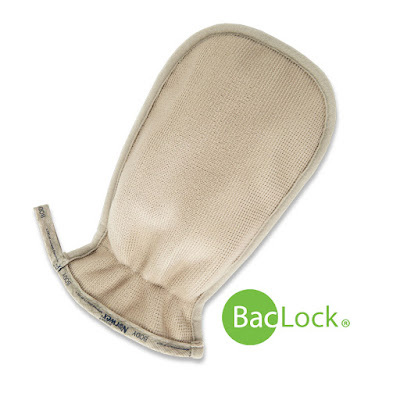 Contains our exclusive BacLock® micro silver agent, allowing it to self-purify and inhibit bacterial odor, mold and/or mildew growth within the mitt. 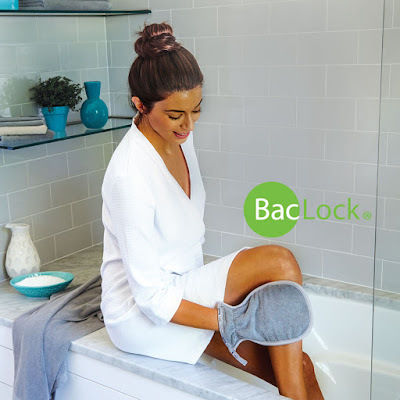 Slip on the ultra-comfortable Body Scrub Mitt with the mesh side facing your palms, and gently massage your neck, back, legs and arms in a circular motion to exfoliate skin and remove dead skin cells and product buildup. Launder in the Washing Net with Norwex Ultra Power Plus™, which contains no fillers, after heavy use. Do not use bleach, fabric softeners or dryer sheets.